Been diving in Batu Bolong? Please Vote! 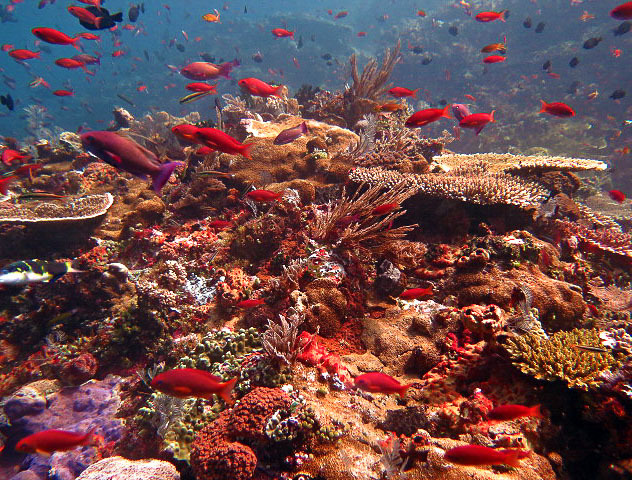 Batu Bolong offers truly world-class diving in the heart of the Komodo Island and National Park Reserve. Although it doesn’t look like much on the surface – in fact it somewhat resembles an odd doughnut-shaped rock hence the translation to “Hollow Rock” – a quick glance underwater reveals what all the spectacular dive stories are about. Batu Bolong is a pinnacle situated between Tatawa and the main Komodo Island and stretches down to a dept of 75 metres. The site is overflowing with marine life of all shapes and sizes due in part to the rare spawning coral and underwater foliage that is prevalent in the area. 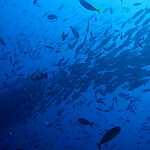 You’ll see all sorts of fish action here – fish that are hiding, fish that are feeding, even fish that are laying eggs. The slopes and walls of Batu Bolong are covered in an array of colours in the form of sponges and hard corals and hawksbill turtles can often be seen feeding off the corals in the area. On the northern side, the pinnacle has a steep drop to around 27 metres and offers fantastic sights within the gully. Divers should look out for reef sharks lurking by the ledge as well as dogtooth tuna, hawksbill turtles, giant trevallies and electric blue surgeonfish. Admittedly, my first thought about Batu Bolong, as I observed the swirling eddies of current like open drains on either side of the rock, was that no sane person would dive here. It took a single look beneath the surface to change my mind. Situated in the middle of a channel and battered by nutrient-rich currents, this small pinnacle is a magnet for underwater life. Diving there is like swimming into a kaleidoscope, with vibrant coral covering virtually every inch of rock, and enough activity to rival the worlds’ busiest cities. From the tiniest critters hiding amongst the reef to big pelagics hunting just off in the blue, Batu Bolong offers something for everyone. I can’t recall a time I didn’t see sharks and a turtle or two, and also caught the occasional manta casually cruising by. 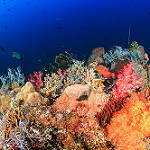 Safety stops in the shallows are akin to watching a fireworks show, with explosions of brightly colored fish bursting between branching table corals. Usually dived on the lee side, one of my most memorable dives was a rare venture into where the current splits around the rock, where I was surrounded by dozens of hunting sharks and tuna. With its overwhelming beauty and diversity, Batu Bolong never let me surface disappointed. Batu Balong is a firm favourite in Komodo and it’s easy to see why as soon as you drop underwater to marvel at the biodiversity melting pot that is this site. Dependant on the tides, I would always dive in the lee of the Island and work my way up in a zig-zag formation along the side of the pinnacle. The site has something for everyone from huge schools of fish, psychedelic macro and hunting pelagics in the blue and as you come up along the pinnacle there is a real variety of captivating sea life. On any dive, you can expect to see giant groupers, sharks, coral trout and invertebrates such as nudibranchs, shrimps and crabs. I would always be prepared for stronger currents on this site especially at the sides of the pinnacle so definitely important to be conscious of group spacing. 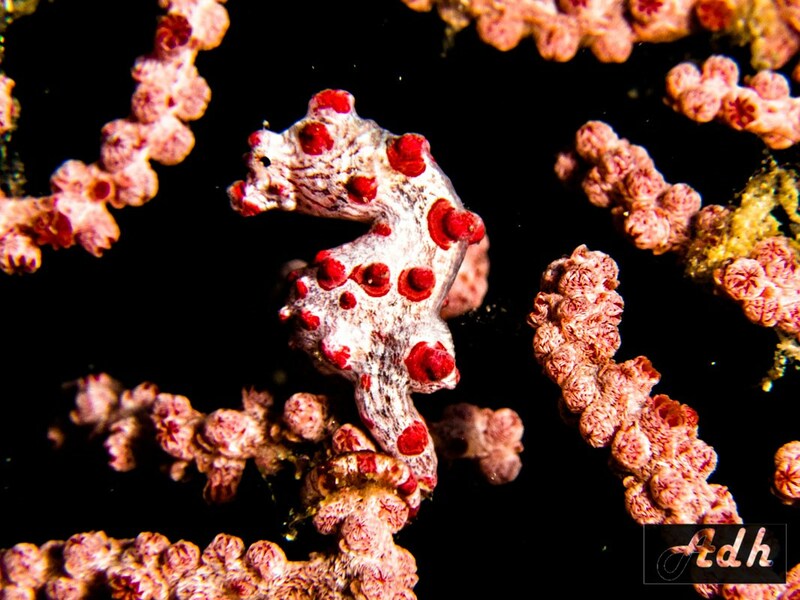 It’s an obvious choice and that is because Batu Balong continues to surprise and humble many divers every year. Map of Komodo, Batu Bolong dive site.